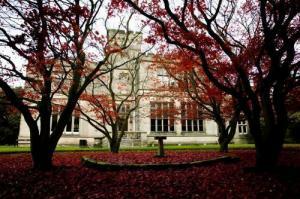 Choose from 116 hotels and guest houses in West Midlands. Shown below a just a selection of the hotels available. To search within an area please use the menu on the right. With free parking, the Premier Inn Hagley hotel is not far from the M5 and less than 30 minutes' drive from Birmingham city centre. Hagley Rail Station is 2 miles (3.2 km) away. 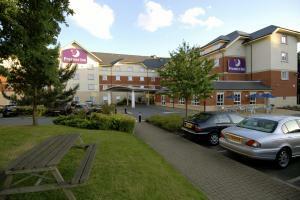 The Premier Inn Hagley has comfortable en suite rooms and an on-site Beefeater Restaurant, serving fresh char-grilled food. Some rooms can take 2 adults and up to 2 children (under 16 years). The 2 children also get a free full breakfast when accompanied by an adult eating a full breakfast. The full all-you-can-eat breakfast has the expected cooked items, including vegetarian sausages, as well as a wide continental selection. This contemporary, canal side hotel provides comfortable and convenient accommodation within easy reach of the NEC, ICC and the city centre. With an on-site bar and bistro restaurant, this is a convenient place to relax away from the stresses of the city centre, which is easily reachable via the motorway network and neaby bus services. Part of the international Campanile chain, this is a thoroughly modern base from which to explore, or to continue your working day. Conference facilities for up to 270 delegates. Ideally located in the heart of Birmingham city centre, this deluxe 4-star property is just a short walk away from Birmingham New Street train station, the ICC and The Mailbox. Crowne Plaza Birmingham City offers you the perfect combination of a deluxe 4-star hotel in a very central location, making it possibly one of the best options when visiting Birmingham. The hotel has a large selection of rooms, all of which are equipped with a variety of amenities including en suite facilities, air conditioning, in-room dining, satellite TV and refreshment making facilities as standard. A range of flexible food and beverage options are available to guests around the clock, with informal snacks in the Terrace bar, ? la carte and table d'h?te menus in the Conservatory restaurant and 24 hour room service, all of which offer creative menus with healthy options to suit all tastes. Right in the heart of Birmingham city centre, just 400 metres from the ICC (International Convention Centre), this modern hotel offers spacious, comfortable and well-appointed rooms. Overlooking Centenary Square, the Copthorne Hotel Birmingham has a superb location, great for the National Indoor Arena and Birmingham New Street Railway Station (both within 700 metres). Shops, attractions and major businesses are all within walking distance. The National Exhibition Centre (NEC) and Birmingham International Airport are just 20 minutes away. Every room has modern comforts and facilities, including satellite TV and dataport internet access. Free wireless internet access is available in the public areas. The hotel has 13 meeting rooms, as well as a restaurant and bar. Enjoy a draught beer or a speciality coffee. Towering 17-storeys high and with panoramic views of Coventry, the award-winning Ramada has recently been converted into a stylish and modern 4-star hotel. The Ramada Hotel & Suites has a convenient location, just off junction 7 of Coventry's ring road, with easy access to the region's major road network. The vibrant city centre is within walking distance and Coventry Railway Station is just a 10-minute walk from the hotel. The hotel is 4 miles (6.5 km) from Coventry Airport and 10 miles (16 km) from Birmingham International Airport and the NEC (National Exhibition Centre). There is a 6-storey secure car park accessible directly from the hotel. Parking is available for guests at a small additional cost. Now completely renovated, the Ramada is a full-service hotel offering high quality accommodation in modern bedrooms and one-bedroom apartment suites. The hotel has a fitness suite and an executive area. Free Wi-Fi wireless internet is available in the hotel's public areas. The hotel has an Italian-style restaurant, with an easy informal atmosphere and a full theatre kitchen. An interesting selection of beers, spirits and wines from around the world is available. 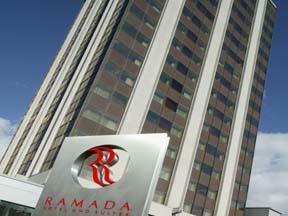 The Ramada Hotel and Suites Coventry was the Gold Award winner of the 2008 Godiva Award for Best Hotel in Coventry and Warwickshire. This charming Coventry hotel with a 2 AA-Rosette restaurant has access to the M6, M42, NEC and Birmingham Airport. The Manor Hotel is set within an elegant Georgian building originally built in 1745. In addition to the luxury bedrooms there is also the relaxed Houstons Bar & Grill. 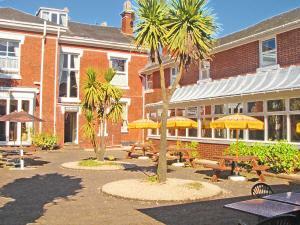 The hotel is an excellent business venue with a friendly atmosphere, free parking and 6 conference suites. Birmingham International Rail Station is 10 minutes away. The Manor Hotel is within easy reach of the National Motorcycle Museum (reduced entrance for hotel guests), Warwick and Stratford upon Avon. In the heart of Birmingham, in the city's thriving Jewellery Quarter, Hatters is clean, modern and comfortable, combining the facilities of a hotel with the fun and character of a hostel. Hatters Birmingham Hostel offers a range of great-value accommodation to suit the needs and budget of any traveller, including secure, private en suite rooms, as well as beds in shared dormitories. All of the rooms are clean, light and stylish. Each of the private rooms is individually decorated with its own unique charm and character. The hostel has a great location, within easy reach of all that Birmingham has to offer, including the shops, nightlife and live music venues. The National Indoor Arena (NIA) is just 0.6 miles (1 km) away and Broad Street is just a 10-minute walk from the front door. Free tea, coffee, toast, jams and juice are available 24-hours a day on an all-you-can-eat basis. Opposite Dudley Castle, in the heart of the Midlands, the hotel is just 5 minutes' drive from junction 2 of the M5 motorway and offers good-value rooms, free parking and a bar and restaurant. With a warm, friendly atmosphere and a convenient location, the Station Hotel is a good base from which to explore the historic Black Country. The Black Country Living Museum is 0.6 miles (1 km) away and Dudley Zoo and castle are opposite. 3 miles (5 km) away, the Westfield Merry Hill shopping centre has some of the best shopping facilities in Europe. Originally built in the 1800s, the hotel was modernised and extended in 1936. Today, the en suite room all have TVs, radios, telephones and tea/coffee. Friendly and relaxed, the restaurant offers great-value food and drink in traditional surroundings. The Lounge Bar leads to a conservatory is where you can enjoy the selection of beers, wines and spirits available. 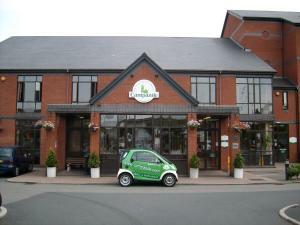 This modern hotel is just off junction 5 of the M6, and offers free Wi-Fi throughout, and free parking. Birmingham International Airport is only 5 miles away. 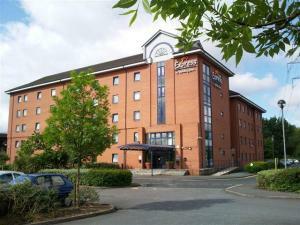 Express by Holiday Inn Birmingham Castle Bromwich is well-located for the NEC and NIA. The comfortable accommodation is spacious and conveniently equipped. 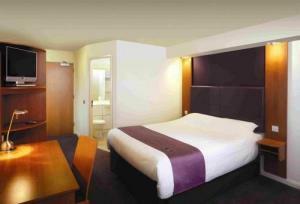 All guest bedrooms have en suite shower rooms and Freeview TV. The hotel has a conference room ideal for small meetings. Major sporting events are shown in the lounge bar. 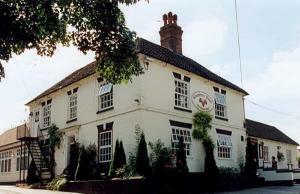 The Cocked Hat is on the outskirts of Coventry, 10 minutes from the city centre and 5 minutes from Coventry Airport. Coventry city centre and bus and train stations are 4.5 miles (7.2 km) away. Warwick, Lemington, Rugby and Nuneaton are accessible, and the NEC is nearby. 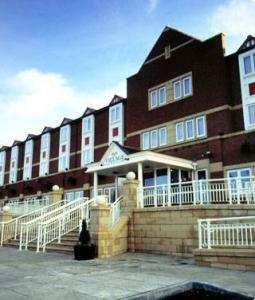 The hotel is adjacent to the newly refurbished Cocked Hat 241 pub, which serves food and drink all day. Rooms are en suite and have tea and coffee-making facilities. The contemporary Hampton Manor has a secluded yet convenient setting in a private country estate just outside Birmingham - perfect for a one-night stopover or a luxury weekend break. The NEC, Birmingham Airport and the M42 are 5 minutes away. Following a ?2 million refurbishment, the 19th-century manor has a collection of luxurious rooms and meeting facilities. Bedrooms boast beautiful woodland views, monsoon showers, stylish baths and a high level of modern comfort. Hampton Manor has 45 acres of woodland and gardens and is the former home of Sir Frederick Peel, son of Prime Minister Robert Peel. In the heart of Birmingham International Airport, only 300 metres from the terminals and a free 90-second shuttle ride from the NEC, the hotel offers spacious, modern, air-conditioned rooms. The Ibis Birmingham Airport has a superbly convenient location, with a free shuttle running regularly to the NEC (National Exhibition Centre) and Birmingham International Railway Station. There is plenty of parking available across the road, with special discounted rates for hotel guests. All of the rooms have 21-inch plasma flat-screen TVs with full media systems including pay TV, high-speed broadband internet access and Wi-Fi. Food and beverages are available 24 hours, and the cafe on the ground floor offers a wide variety of meals, snacks and drinks. A hot buffet breakfast is served from 04:00 to 10:00 midweek and to 12:00 on weekends. Reception is open around the clock and wireless internet access is available throughout the hotel, at an additional cost. Situated in leafy Edgbaston, this Grade II listed Victorian property sits amid private gardens, just a short hop from Birmingham City Centre. Built in 1854 and with numerous restaurants, night-clubs and casinos in the vicinity, this attractive property offers a selection of tastefully decorated en suite accommodation. A number of rooms offer relaxing views of the hotel gardens, which are complemented by a private central courtyard, enabling the hotel to provide a secluded location in which to end an enjoyably hectic day. A residents' bar is available on-site, with 24 hour access. A function room is available for meetings, conferences and other gatherings of up to 35 people. Just over 1 mile from city centre, situated in the immediate vicinity of Birmingham's best nightclubs and restaurants. 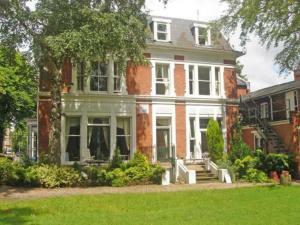 The Hotel is situated in leafy Edgbaston, offering luxurious surroundings and a friendly atmosphere. Built in 1854, The Edgbaston Palace is a modern hotel offering a high standard of comfort and cleanliness. All rooms are en-suite facilities with colour televisions and tea and coffee making facilities. We also have conference rooms to suit your conference needs and also provide an excellent wedding package. Don't miss out on our Friday and Saturday Special Rate!!! Offering 7 acres of landscaped grounds, free parking and easy motorway access, this hotel sits on the edge of a green belt, 11 km (7 miles) north of central Birmingham. This Holiday Inn is well-placed for the M6 (junction 7), M5 (junction 1), M42, M54 and the M6 toll. This hotel offers free meals and accommodation to children with accompanying adults, as well as the Traders Restaurant, Hub Bar and a modern Lounge to enhance the food and beverage experience. The Spirit Health & Fitness club is also on-site, providing massage and beauty treatments along with exercise classes. Village Coventry has a wide range of leisure facilities including a 25-metre pool, a gym and a health and beauty studio. There are 2 places to eat and plenty of conference facilities. The rooms come with free Wi-Fi, exclusive beds and a flat-screen TV with satellite channels. Enjoy a meal in Verve Bar & Grill or Victory Pub and Kitchen. Attractions include Stratford upon Avon, Warwick Castle, Coventry Cathedral, Royal Leamington Spa, Drayton Manor and Cadburys World. 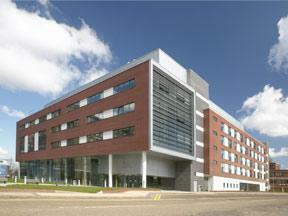 The NEC is 9 miles (14.5 km) away with easy access from the nearby Cranley Train Station, which stops outside the NEC. Coventry Airport is 6 miles (9.7km) away. In the heart of Coventry's city centre, close to the cathedral and the West Orchard shopping centre, the hotel offers great value, with spacious, comfortable and modern en suite rooms. With a superb central location, the Premier Inn Coventry City Centre is close to the Belgrade Theatre, the Cannon Park shopping centre and all that the city has to offer. The SkyDome Ice Arena and Coventry's bus and train station are less than a mile (1.6 km) away. The hotel has a 24-hour reception desk and some rooms can take 2 adults and up to 2 children (under 16 years). The 2 children also get a free full breakfast when accompanied by an adult eating a full breakfast. An all-you-can-eat buffet breakfast is available each morning and includes scrambled, fried, poached or boiled eggs, and pork or vegetarian sausages. There is also a wide continental selection. The on-site restaurant and bar offers good food and drink at reasonable. 6 miles south of the historic city of Coventry, this modern hotel offers comfortable, well-appointed en suite accommodation in a convenient location, with great access to the region's major roads. The hotel has a great location for visiting Coventry, the Ricoh Arena, the National Agricultural Centre and Coventry Airport. The proximity to the area's major roads makes the hotel a great base, whether you are visiting the city on business or exploring the city and the surrounding region for leisure. There is a large free car park for guests' use. Each of the hotel's 51 en suite rooms is spacious, comfortable and well equipped, with all the modern comforts and facilities you need in a restful, relaxing base, including high-speed internet access and a TV with 24 digital movie channels. The good facilities include room service, a 24-hour reception desk, a restaurant, lounge bar and mini-gym. In Wolverhampton's vibrant city centre, just 500 metres from the train station, this modern hotel offers great value and guaranteed standards of service, with spacious, contemporary rooms. The Novotel Wolverhampton City Centre was the winner of 3 Black Country Tourism Awards in 2007, including Gold for restaurant service. Extensively refurbished over the last 2 years, the hotel has spacious and comfortable rooms with multimedia flat-screen TV systems with pay-per-view movies and internet access. Wi-Fi is available in most rooms at an additional cost. Rooms have luxury walk-in showers, comfortable sofas, minibars, laptop safes and ergonomically designed pivoting desks. Elements Restaurant offers a range of dishes, all available in taster, starter and main-course sizes. Up to 2 children (under 16 years) can stay free (with breakfast) when sharing a room with adults. This includes access to video games, baby equipment and a healthy children's menu. Families also get late check-out on Sundays (until 17:00). 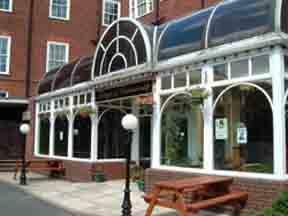 Strawberry Bank is a homely hotel and restaurant in picturesque Meriden, near Coventry. The NEC, Birmingham International Airport and the M42 are less than 5 minutes away. The family-owned Strawberry Bank has an acre of peaceful gardens. The quiet, comfortable rooms have tea/coffee. The menu at Strawberry Bank restaurant offers English dishes with a Mediterranean influence. Grilled fish and vegetarian dishes are available. Most dietary needs can be catered for upon request. There is also a cocktail bar with an extensive range of drinks.